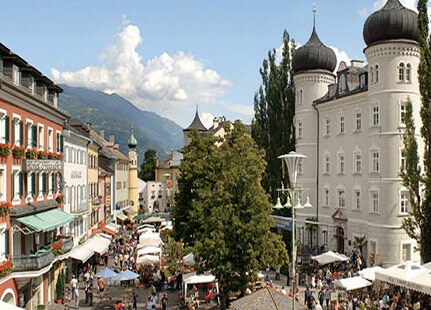 The pearl of the Osttirol, not far from the Italian boundary, introduces itself with its beautiful Hauptplatz, or the main square, from which the main streets branch off, rich open-air cafes and beautiful old buildings that succeed one another until you get to the sparkling baroque church of Antoniuskirche. The Schloss of Bruck, that is the castle full of history, is one of the artistic testimonies of Nordic art: in ancient times it belonged to the Friulian counts and subsequently became one of the properties of Habsburg dynasty. Even today, inside the walls of the Castle, you can remark the vaulted ceiling in Gothic style of the Hall of the Knights, Rittelsaal, while the other rooms host the modern Museum of East Tyrol. The Church of Saint Andrea, on the other hand, is famous to houses the oldest sacred organ in Austria. Another point of interest not to be missed is the Franciscan Convent founded by the Carmelites in 1349. But what attracts most of Lienz is the wonderful surrounding nature that offers the possibility to practice outdoor activities of all kinds. One of the most beautiful places in the area is the wild Assling park, very close to the city, which offers a view of over 100 animal breeds. You can explore alone or with a guide that leads to the sighting of wild animals.